If there's one event I am more than willing to give a second chance after a decidedly disastrous trial run it's the charmingly determined LA Street Food Fest. 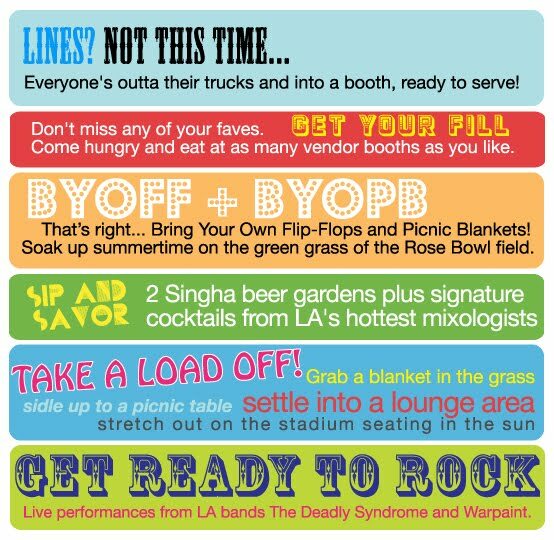 Quick to clean up its reputation, the fest isn't waiting until next February to go at it again, rather re-conceptualizing the event July 24 as a festive all-inclusive Summertime tasting fair at Pasadena's world famous Rose Bowl. The all-inclusive ticket price ($45) benefits St Vincent Meals on Wheels & Woolly School Gardens, and covers all food booths, open bars, live music, and parking. 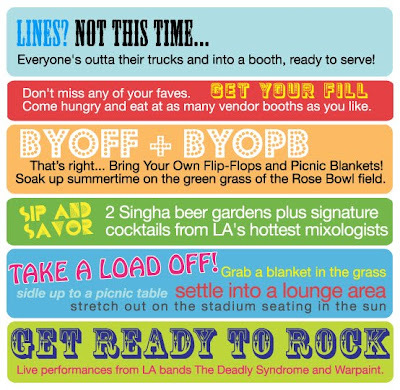 The spacious Rose Bowl should alleviate the overwhelming crowds of the previous event, plus all some 60 vendors (including hot gourmet food trucks, old school carts and stands, celeb chefs and street inspired dishes from LA’s best restaurants) will be out of their trucks in booth tents on the lawn, prepared for the onslaught. Not willing to compromise missing out on your gourmet grilled cheese? A VIP ticket ($65) is available for a full preview hour and VIP parking before the gates open. Get your tickets, this will surely, once again, sell the eff out.